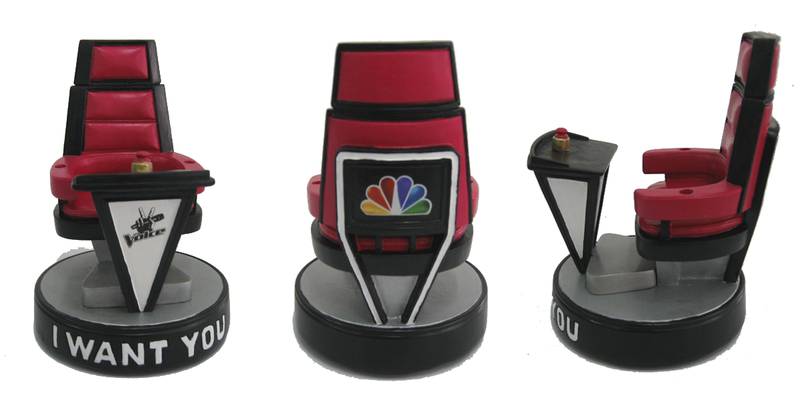 NBC wanted something original and one of a kind for one of their top rated shows, The Voice. We created a chair that is a replica of the judges’ chair on The Voice. But there’s more – it sings, it spins! The chair’s sound – motion activated system plays The Voice theme song when spun. We engineered the piece to find the ideal materials and sound components to keep correct scale and proportions, and still add all the bells & whistles. The 9” tall chair is a beautiful collector’s item and you’ll find them nestled in show cases at various affiliate stations around the country.